As far back as six centuries before Christ, soldiers have been taught a simple strategy: know your enemy. It was the famed Chinese general and strategist Sun Tzu who coined the phrase, and it reveals an important truth. If forced to do battle, an army gains a distinct advantage by knowing everything about who it battles. The call to follow Christ is a call to war. Every Christian wages a lifelong, all-out war against the world, the flesh, and the Devil. Satan was man’s first adversary, and he will be his adversary to the end. Yes, Satan’s reign was broken at the cross, but for the time being he still wields his power as we await Christ’s return. It is good to know your enemy. Yet there is a particular temptation that comes with knowing your enemy: you may inadvertently become like him. They say that the way to train people to identify counterfeit currency is not to have them study counterfeit money but to study the real thing. When we know what is true, what is genuine, we are equipped to quickly recognize and root out what is false. In Living Free in Enemy Territory, a book that deals specifically with Satan, Greg Dutcher takes just that kind of approach. Instead of dwelling on the person and work of Satan, he dwells upon Scripture, upon God’s source of light and truth. And in the light of Scripture, Satan looks exceedingly dark and his work outrageously horrifying. As much as it is good to know your enemy, it is even better to know the One who can smash—who has smashed!—the head of that enemy. Dutcher does an admirable job of drawing the reader to the work of Christ, to the One who has done just that. 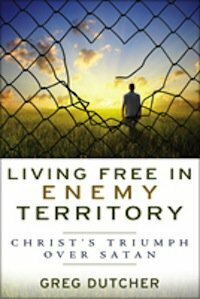 This short book shows how to live free in enemy territory. And the way to do that is not to ignore the Enemy, but neither is it to dwell upon him. The way to live free is to bow before the One who has already conquered Satan and who now waits for the day when He will destroy him forever.